Vermont Sen. Bernie Sanders won the Hawaii Democratic caucus, claiming every state up for grabs in Saturday's presidential contests, the Associated Press and the Washington Post projected after hours of delays from the state party. Sanders trounced front-runner Hillary Clinton in the caucus, holding a double-digit lead, according to USA TODAY's election data page. 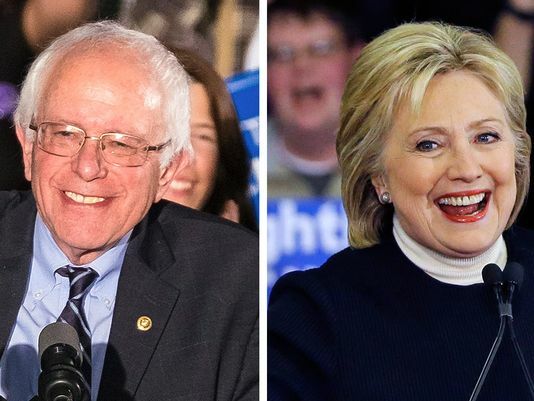 With 88% of precincts reporting, Sanders has 70.6% to Clinton's 29.2%. Sanders swept to victory in the Democratic caucuses in Alaska and Washington state Saturday, as he sought to cut into Clinton's commanding delegate lead and gain fresh momentum in his bid for their party's presidential nomination. Voters across the country held their breath for hours as they waited for the official results in Hawaii, where 25 delegates are at stake. The delays in results come as the party experienced a surge in voter turnout comparable to the 2008 caucus when then- Sen. Barack Obama was running against Clinton for president, the Honolulu Star Advertiser reported. The delays made some voters restless, including some Sanders supporters who claimed the delays were part of a "media blackout." Washington state, with 101 delegates up for grabs, was Saturday’s biggest prize. Sanders fought hard for the state, holding big rallies in the last week to drive turnout among the kinds of young and liberal voters who have helped him prevail in earlier caucuses. Sixteen delegates were at stake in Alaska. "We are making significant inroads in Secretary Clinton's lead, and we have a path toward victory," Sanders told a cheering crowd in Madison, Wis., on Saturday, following his Alaska win. "It is hard for anyone to deny that our campaign has the momentum." Sanders' drive to win Saturday's trio of Western states comes as the race heads back to the Midwest and Northeast next month, territory that could prove favorable to Clinton, who has outperformed Sanders in more racially diverse states. Next up: Wisconsin, which votes April 5. Clinton's home state of New York, where a whopping 291 delegates are up for grabs, will vote April 19. It was no coincidence that Sanders celebrated his Western victories in a Wisconsin college town Saturday night. Sanders, who outraised Clinton in January and February, is expected to parlay his weekend wins into a fresh round of online donations. Despite his victories Saturday, the delegate math still favors Clinton. She headed into Saturday's contests with a big lead among pledged delegates. When party officials, known as superdelegates, are added in, Clinton’s advantage grows even larger. The states making their choices Saturday were friendly ground for Sanders, who relied on caucus victories in seven of the 11 states he had won heading into this weekend. In addition, some of his strongest performances in the nomination battle have come from states in which white voters make up a large share of the electorate, indicating an edge in Alaska and Washington. In more diverse Hawaii, Clinton has the support to several top officials, including Sens. Brian Schatz and Mazie Hirono. Sanders, however, has the backing of a popular figure in the state, Rep. Tulsi Gabbard, a rising Democratic star who resigned her post as vice chairwoman of the Democratic National Committee last month to openly campaign for Sanders in the Aloha State. Gabbard, a combat veteran, cut an emotional commercial for Sanders, highlighting the toll of overseas combat and Sanders' opposition to the Iraq war. Washington had been the most hotly contested of the three states staging contests Saturday. Clinton dispatched her husband, former President Bill Clinton, and daughter, Chelsea, there on her behalf. Sanders himself crisscrossed the state. Even with Sanders' big wins Saturday, Clinton also added delegates to her column because the party awards them proportionally. A pro-Clinton super PAC recently announced it was reserving $70 million in television advertising to start after the national convention in Philadelphia. Sanders’ fundraising prowess, however, could give him staying power deep into the primary election calendar. He has collected nearly $140 million over the course of the election cycle. Clinton's camp, anticipating a strong Sanders’ performance Saturday, issued a fundraising appeal before his wins had been announced. “We’re still being outspent on the air in key states, we haven’t caught up in online fundraising,” campaign manager Robby Mook told supporters in the email. One clear sign that Sanders intends to stick around: On Saturday, he opened a campaign office in Brooklyn — the same New York borough as Clinton’s national headquarters — in preparation for the state's primary.